Note: If you've already read the Strawberry Special K Snack Bites review, you may want to skip to the bottom. In a nutshell, Vanilla Special K Snack Bites are super great. I found that they satisfied both my sweet-tooth cravings AND my chip cravings. The taste is what you might expect... like a cookie made with vanilla cereal... sweet, but not enough to whack out your tastebuds. Compared to their Strawberry Snack Bites, I preferred this variety, but that was mostly a matter of personal taste. The best surprise was the texture. The individual Snack Bites are a cross between a cereal flake and a chip. In fact, the texture reminded me a little of Frito-Lay's Sun Chips. 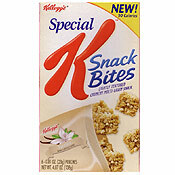 What do you think of Vanilla Special K Snack Bites? I can't find these Special K Snack Bites. Can you please tell me what store I can buy this product. I tried them out and got hooked. I just can't find them in the store. I love to mix the vanilla snack bites in vanilla yogurt, they taste like vanilla cookies but I can't find them anywhere lately. Only the chocolate and strawberry. I enjoy the Special K Vanilla Snack Bites, but lately cannot seem to find them. I've only been able to find the bars. Can you let me know what stores might be carrying them in the Baltimore or Pikesville, Maryland area. Thanks! I expected a sickeningly sweet cardboard snack. 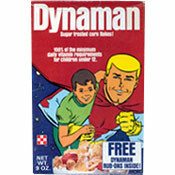 BUT...the Vanilla Special K bites were AWESOME! My new favorite... Thank you so much. Now... can you do the same type of chip as a savory or salty snack??? I think you have the crunchy texture down... I would love a salty type to eat with lunch. These are amazing. My son loves them too. Can't buy enough of them. I usually don't like vanilla flavored items, but these taste like vanilla oreos to me! yum! The vanilla variety tastes like marshmallows :) What a nice replacement for dry Lucky Charms!